Phoenix systems manufacturers reverse brake bleeding kits. 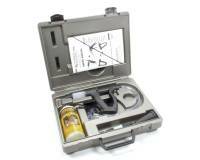 These kits pump fluid from the caliper up toward the master cylinder which makes bleeding brakes a one man job. 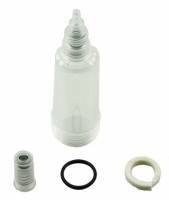 Check out the Recently Listed Brake Bleeder Adapter And Components. Check out the Recently Listed Brake Bleeder Wrenches. Check out the Recently Listed Brake Fluid Test Strips. We at Phoenix Systems are committed to providing cutting edge tools and technology for the auto care industry. Phoenix Systems was founded with the idea that persistently applying new technologies to existing challenges will result in better solutions. We pride ourselves on our commitment to our customers and their success. We stand by every product we make and are constantly striving to bring new and innovative solutions to market while delivering greater value to our customers bottom lines. We safeguard stopping power by developing the latest in breakthrough technology. Phoenix Systems holds over a dozen US and foreign patents as a result of our pioneering efforts in the automotive undercar industry. Every tool we make utilizes new patented technology, there are no ?me too? tools in this industry. A 1989 Chevy pickup brought Phoenix Systems into existence in 1994 when Jon Petty, the company?s founder, developed a rudimentary Reverse Fluid Injection system to bleed a clutch system. That early prototype was developed and refined into the multi-patented product selection of brake bleeder Reverse Bleed Technology systems used by thousands of professionals and at home mechanics across the country. So effective is the reverse brake bleeder line of products that the MAXPRO is now considered a standard issue tool in the US military. In November of 2000, Phoenix Systems released another ground breaking piece of technology, the BrakeStrip. After spending thousands of hours on research and development, Phoenix Systems developed FASCAR Technology, which gives an automotive technician the ability to check the quality of a vehicle?s brake fluid with a simple and easy to use paper strip and color code system. This revolutionary copper test system follows Motorist Assurance Program (MAP) guidelines for brake fluid testing. To date over 40,000 devices have been sold utilizing Phoenix Systems Reverse Bleed technology, and close to 100 million BrakeStrips have been shipped.